This is an engaging novel told from the perspective of Amadou, a child worker whom along with other boys work on a cocoa farm far away from home. The conditions under which they work are deplorable but they had come to accept their fate as impoverished children whose livelihood depends on them working for rich people from far away. Amadou and his brother Seydou accepted their fate until a girl is forcefully thrown in their midst. This girl’s fighting spirit inspires them to hope for something better. The map of Africa that highlights Ivory Coast and the surrounding countries gives the reader a sense where the story is taking place. What is fresh about this story is the irony it brings to the business of chocolate manufacturing. The story also reveals the brutality involved in child labor practices, but contrasts this with children who work legally and/or to help their families. The first half of the novel seems more engaging than the later half as the plot moves toward resolution, and the ending seems rushed. However, the present tense narrative makes the experience quite immediate and captures the child trafficking/labor plot and the dangers in a very intense way. 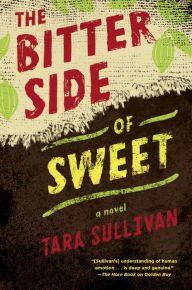 There is an author’s note where Tara Sullivan explains her research process and a glossary of local words. This book was educational in the field of historic fiction and now in day child labor. A great read for 12+ audiences. Love the bonus questions and discussion content from Tara Sullivan. However this book could have been better with an introduction towards the characters and relations.